As soon as the first of these bitter oranges hit the shops I set aside several days to make batches of marmalade –enough hopefully to last the year. For a week the kitchen windows fug up with the condensation from the preserving pan and the house is filled with the unmistakeable aroma of candied orange. Seville oranges are only available for about a month (mid Jan-mid Feb) although they freeze very well so you can spread the marmalade-making out over a few months if that suits better. 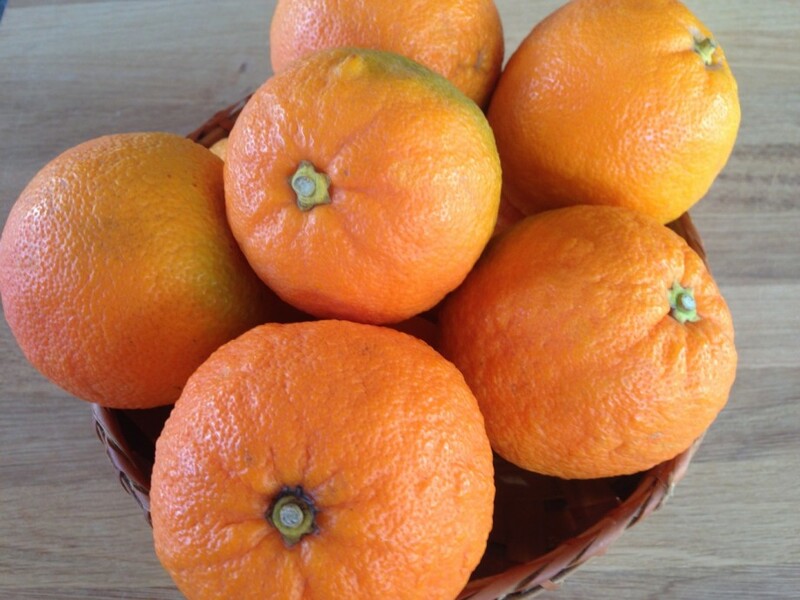 Of course you can make marmalade without these special oranges but if you like a deep, rich flavour to your marmalade there is no substitute. Most years I make two varieties of marmalade both using Seville oranges, one being a classic light-golden type while the second lot is a deep, dark, muscovado-rich batch. Click on the Larder section for a recipe. And remember marmalade is not just for toast-stir into a creamy custard base for a deliciously intense orange ice cream or add a spoonful or two to chocolate mousse. The juice of the Seville orange also makes a most wonderful orange curd. Use this to sandwich a Victoria sponge along with a lick of whipped cream.